Jordan Cooper, who is running for a seat on the Montgomery County Democratic Central Committee (MCDCC), has endorsed five Republican candidates for office. That’s an interesting choice given that the entire job of MCDCC is to promote the Democratic Party’s agenda and candidates. Cooper ran unsuccessfully for Delegate from District 16 in 2014. He is running for that seat again while simultaneously running for a seat on MCDCC. Cooper blasted the county Democratic Party as “corrupt” for passing a rule barring candidates from running for party office and government office at the same time. But as the links above plainly show, he is not covered by the rule since he had filed for the two offices before the rule was passed and it was not retroactive. Since then, Cooper sent out a questionnaire to other candidates for the purpose of endorsing them. In defending his “endorsement process,” Cooper said he intended to endorse Republicans. He spoke the truth. His Public Interest Podcast endorsed 88 candidates for office, of whom five were Republicans. As a private citizen, Cooper can support anyone for office he wants. But he is running for a seat on the governing body of the county Democratic Party. Article II of MCDCC’s by-laws state, “It shall be the responsibility of this organization to promote, establish and conduct political campaigns in Montgomery County, Maryland for the nominees of the Democratic Party and to act as spokesman for the Democratic Party in this County on all questions of public policy.” In other words, one of the prime reasons for MCDCC’s existence is to elect Democrats in Montgomery County. Of Cooper’s endorsees, six – Republicans Drozd, Hernandez and Phukan and Green Party members Cook, Jeang and Schlakman – are running against Democrats for offices representing Montgomery County. Is it too much to ask someone who wants a seat on the county’s Democratic Central Committee to support the party’s candidates for office? Bananacakes or Not? Cooper Says No, 7S Says Oh Yeah. The Muslim Democratic Club of Montgomery County issued a questionnaire and its founder and Political Director Hamza Khan is a candidate for District 15 Delegate according to the Seventh State website. The Latino Democratic Club of Montgomery County issued a questionnaire and both Gabe Albornoz and Nancy Navarro are candidates for the Montgomery County Council while sitting on the LDC Board. Casa De Maryland issued a questionnaire and Alonzo Washington is listed as Casa’s Housing and Community Development Manager while also serving as a delegate. Serving as a member of the Maryland General Assembly is considered to be a part-time job. State delegates and senators frequently have other means of employment concurrent with their service in elected office. Indeed even members of the Montgomery County Council, which is considered by many to be a full-time legislative body, have additional part-time positions. Just as many members of the legislature and many candidates for elected office have other jobs, so too do I as the host Public Interest Podcast. It is entirely within the realm of accepted practice for candidates and elected officials to be involved with political organizations and for those organizations to issue endorsement questionnaires. I’d like to add that Public Interest Podcast is a non-partisan entity and, much like The Washington Post, The Baltimore Sun, and other periodicals, issuing endorsements in no way diminishes the non-partisan nature of the endorsing organization. Endorsements will be issued by Public Interest Podcast based solely upon candidate responses to the questionnaire regardless of party affiliation and regardless of whether those candidates’ views are aligned with my own political views. Adam: I am not defending those other organizations. But there is a difference here: they involve more than one person and can establish recusal procedures. You ARE Public Interest Podcast. There is nothing else there other than you recording interviews with people. David: I called out Progressive Neighbors four years ago for having a ridiculous number of candidates on their board. Dana Beyer even sent a questionnaire to her opponent. I believe that they’ve fixed the problem and have no candidates on their current Steering Committee. Adam is also correct that PIP is you of course. I hadn’t thought of a recusal process before. I could very well have someone else go through the endorsement responses and give them metrics for endorsement, say 7 of 9 questions have a Yes. That would be very fair wouldn’t it? In any case I can assure you that Republicans with whom I disagree personally on many issues will receive a Public Interest Podcast endorsement. I just don’t see a conflict of interest here. Perhaps we’ll have to agree to disagree on this. I did ask quite a few people before I sent out the questionnaire if they thought it was ethical or would present any problems and they told me that as long as I keep the campaign separate from the podcast there’s no reason why I shouldn’t use this opportunity to get candidates speaking about some of the issues I raised that no one else is talking about. David: People frequently misunderstand that someone who recuses themselves from a process does not participate in it. Someone who designs a process for rating other candidates has not recused himself. I don’t see how one can keep the campaign separate from the podcast. It’s questionnaire season, and candidates are getting absolutely deluged by them. But one questionnaire stands out. That’s because it was drafted and sent out by… a candidate. 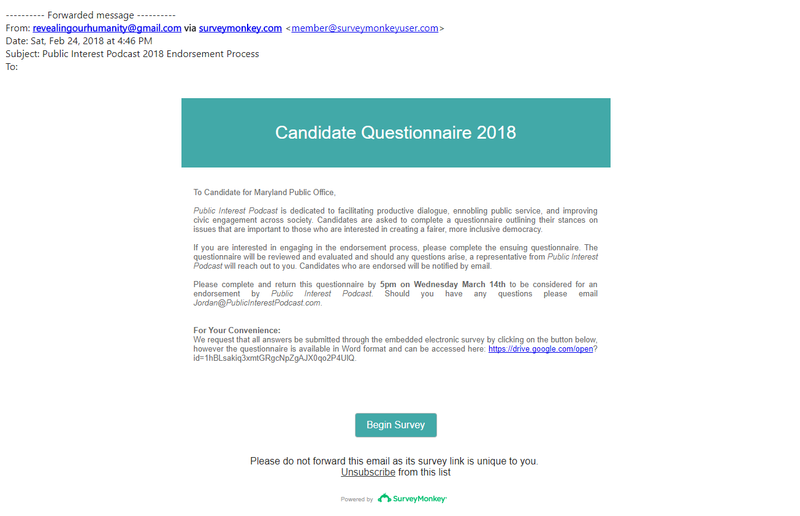 On Saturday, the email below was sent to candidates asking them to fill out a questionnaire from the “Public Interest Podcast” to obtain an endorsement. The contact was Jordan@PublicInterestPodcast.com. We reprint the first page of the survey below. Note the intent of the organization to “Fill the vacuum left by the disappearing Fourth Estate (i.e. traditional journalism), especially with regard to local and state issues, thereby increasing informed voter turnout by familiarizing voters with their elected officials.” The full survey can be found here. 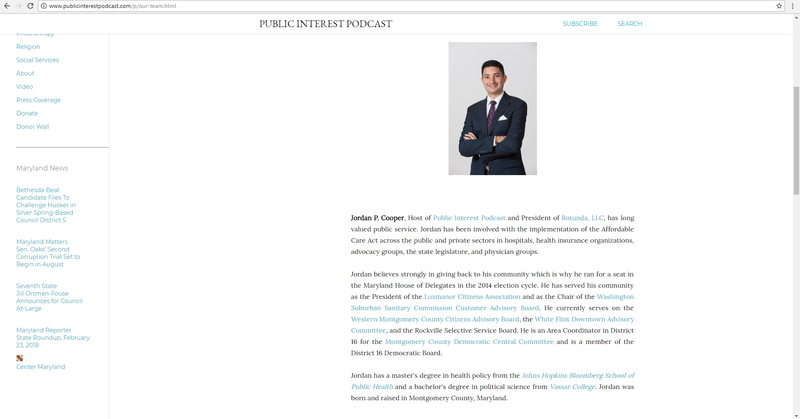 Public Interest Podcast is hosted by Jordan Cooper, who is a candidate for Delegate in District 16 and also a candidate for the Montgomery County Democratic Central Committee (MCDCC). We reprint the Our Team section of Public Interest Podcast’s website below to identify its host as Cooper. And so we have something extremely rare in MoCo politics: a candidate who drafts a questionnaire for other candidates with an endorsement on the line. Aside for running for Delegate, Cooper is known for one more thing: attacking MCDCC. He has criticized them for “corruption” in part because some members get appointed to the committee and then vote to appoint themselves to the state legislature. In other words, he alleges a conflict of interest in roles. That seems to be going around, yeah? Last night, the Montgomery County Democratic Central Committee considered several rules changes, including provisions involving conflicts of interest and the “Cooper amendment,” designed to prohibit candidates from running for office and MCDCC simultaneously. Today, I am pleased to present this response by Jordan Cooper. On Tuesday February 13, 2018 the Montgomery County Democratic Central Committee (MCDCC) voted to prohibit candidates from seeking election to the MCDCC, a partisan political body, while seeking elected office in government. The practice of simultaneously holding a seat in the Maryland General Assembly while sitting as a member of a Democratic Party Central Committee is long established in Maryland and is currently the practice with numerous members of the state legislature from other jurisdictions outside of Montgomery County. The vote of the three dozen individuals who sit on the MCDCC drowned out the voices of the one million people who populate Montgomery County. It is worthwhile noting that the MCDCC subsequently voted to prohibit its own members from seeking other elected offices but that this provision would not apply to the current election cycle, unlike the first decision that is effective immediately, thus annulling the candidacies of all persons running for both public and partisan office simultaneously. The MCDCC elected to inequitably apply the implementation of the new rules so as to benefit those among them who are currently seeking a seat in the Maryland General Assembly. More than half of the MCDCC’s current membership has been appointed to the body including all of its officers. None of these individuals have been elected into their current office and yet they are responsible for having effectively appointed one in three members of the Montgomery Delegation to either the Maryland House of Delegates or the State Senate. That’s right; individuals who were appointed to the MCDCC in turn appoint themselves to the state legislature. The MCDCC has effectively become a de-facto channel for bypassing popular election into the Maryland General Assembly. One would be excused from concluding that the MCDCC is a self-serving body of individuals that seeks to control our government by eluding the direct election of our representatives. Their aforementioned votes indicate their contempt for Democratic voters in Montgomery County who are now being denied the opportunity to determine who, among the willing candidates, will represent them in their local Democratic Party. This perversion of democracy is indicative of a deeply corrupt Democratic Party that undermines popular participation in our elections. This is the same Democratic Party that created some of the most gerrymandered congressional districts in the nation based upon the presumption that having more Democrats elected to Congress is more important than providing Marylanders with free and fair elections. One can only conclude that it has been in the interests of the MCDCC and of the incumbents in the Maryland General Assembly to depress voter turnout so as to ensure that those favored by the Democratic Establishment prevail on Election Day. Incumbents in Montgomery County are re-elected at a nearly absolute rate and they are elected in off-year gubernatorial Democratic Primary Elections in which only 1 out of every 6 registered Democrats participates, in which participation is closed to all voters who are not registered Democrats, and which are scheduled in the middle of the summer while families are away on vacation. During the last election cycle in 2014 less than ten percent of the population of District 16, where I ran and where I am once again a candidate, elected the Democratic Party nominees who inevitably went on to win the General Election. Low voter participation favors incumbents who have name recognition among “super voters” and candidates tend to target these individuals on the campaign trail, effectively relegating the remainder of the population to electoral oblivion. As an Area Coordinator for the past few years I organized phone banks and canvasses with elected officials that specifically targeted Democrats who had not participated in every election for the past few cycles. The MCDCC had pledged support but that support never materialized. I stood up at the MCDCC event to articulate my interest in reaching out to disengaged and disenchanted Democrats while also seeking to drive down healthcare premiums and to reduce the teacher to student ratio as a means of addressing overcrowding in our schools. I explained my steadfast support of the Democratic Party and its candidates in Maryland since I first worked for the Maryland House of Delegates in 2003. And the MCDCC voted to prevent my name from appearing on the ballot this June in a manner that has been permissible for decades. The only rational conclusion that one can draw from the behavior of the Democratic Party in Maryland is that it is corrupt and that it is in need of a desperate overhaul of its leadership, its objectives, and its platform. The Democratic Party should be one of inclusion that facilitates participation in our democracy. It has shown itself to be decidedly against popular participation in our electoral process and has consistently demonstrated its interest in anti-democratic and collusive measures that undermine our democracy. After my post about the poll testing Jordan Cooper’s name came out, a highly placed spy close to the District 16 Race alerted me that Hrant Jamgochian also has a poll in the field. The pollster of record is PPP (Public Policy Polling). PPP only does robopolls and are therefore prohibited from including cell phones in their surveys, which skews their samples a bit. Nonetheless, they are a top tier, reputable pollster. The survey was in the field a few weeks ago. It tested descriptions of Marc Korman, Hrant Jamgochian, Bill Frick, Ariana Kelly and Jordan Cooper. It also tested issues. A few days ago, a one of three Democratic primary voter reached out to me to with some mildly interesting news: they had received a live telephone survey testing positive and negative messages regarding Jordan Cooper’s candidacy in the District 16 delegate race. My educated guess would be that the poll is from Jordan Cooper’s campaign since any other candidate polling would not have focused on him, or at least also asked questions about Marc Korman, Hrant Jamgochian, Ariana Kelly and Bill Frick. Except that Jordan Cooper says he did not do the poll. At any rate, it should make him feel good that someone is taking him very seriously. I guess we’ll see when the next campaign finance reports come out. How things have changed since David profiled this race. Until filing day, it appeared that Marc Korman and Hrant Jamgochian would coast to victory in District 16. However, Bill Frick’s surprising decision to forgo the AG Race in favor of reelection has transformed it into what promises to be a hard fought, tough primary battle. Marc Korman is an Attorney at the storied firm of Sidley Austin and a former Capitol Hill Staffer. He also serves on the Montgomery County Democratic Central Committee and is well respected and well liked throughout the County. Previously, Korman turned down several opportunities to take strong shots at this seat–twice for appointments and once in the 2010 primary. He has hired Sean Sinclair of Sinclair Strategies–a well respected if small Boston based shop–as his general consultant. Korman’s fundraising has been exceptionally strong with $120,000 on hand in January. His campaign manager was the operations director on U.S. Rep. Rush Holt’s 2013 Senate bid in New Jersey. Hrant Jamgochian is also an Attorney and internationally known health policy expert. He ran a strong campaign for this same seat in 2010. This year, he has retained the services of Bob Creamer to lead his consulting team. Creamer has been a national powerhouse for decades. He is also a convicted felon (check cashing fraud) which could be a line of attack in this well heeled district should the campaign turn negative. Jamgochian’s Campaign Manager was the Field Director on Nevada State Assembly Speaker John Oceagura’s congressional campaign. His campaign funds are roughly comparable to those of Korman. Both can be expected to run strong, professional, and very well funded campaigns. Both are exceptionally well qualified to serve in the House of Delegates. Sadly, only one will be able to have the privilege of representing their neighbors in Annapolis, as the other two seats are held by two strong incumbents–Frick and Del. Ariana Kelly. Several other candidates are also running in D16. Jordan Cooper‘s campaign shows exceptional hustle. However, he has only raised $22K and his well-meaning effort nonetheless sometimes strikes people as too hard charging. Still, Cooper is working very hard and is really committed to this campaign. Rating: Frick and Kelly have a straightforward path to reelection. Toss Up between Korman and Jamgochian for the open seat. I just wanted to thank the Montgomery County Young Democrats for having me over tonight. I had a blast meeting lots of people and sizing up the races. Oddly enough, I even got to feel young as the MCYDs are older than the students I taught earlier in the day. Paraphrases of a few of the really good questions they asked: Will the state legislative delegation and county council get along better after the elections? Why isn’t there more competition in the County Council races? Which incumbent is most likely to lose the at-large races? Will the General Assembly take up legislation on GMOs soon? Will our delegation be more progressive after the election? How can our elected officials be more effective in Annapolis? Kudos to Melissa Pinnick for taking the lead in organizing a MCYD team for the American Cancer Society Relay for Life in Rockville. Click to sign up for this event or make a donation in support of this event. I’d say it was great to meet future leaders but this is an active and influential group. Almost all of them are already highly active in leadership roles around the County and the State. They’re also smart. They found the secret entrance on Platform 2 1/2 of the Bethesda Metro Station to the B-CC Regional Services Center. Marc Korman and Jordan Cooper promised that, if elected, they’ll make it easier to find. Today I will withdraw my candidacy for the Democratic Nomination for State Attorney General and file for re-election to the Maryland House of Delegates. My two terms in the House have been exceptional. I’ve been a part of a team that has enacted marriage equality for all Maryland couples, repealed the death penalty, protected consumers from abuses, and begun the task of reforming our tax code. While I know that I could have been a valuable asset to the State as Attorney General, there is still much to be done as a member of the House representing District 16. Bill was always a long shot for AG. His withdrawal from that race can’t help but aid Sen. Brian Frosh from the same legislative district in his bid to beat Del. Jon Cardin and Del. Aisha Braveboy for the Democratic nomination for AG. Rumor had it that Bill might retire from politics if he didn’t win election to AG, so the switch to the delegate race is a bit of a double surprise–at least to your gentle correspondent. In this case, a politician staying in office is good news. Bill is a terrific delegate: smart, effective, and well-liked by his colleagues. He is a shoo-in for reelection to the House of Delegates and I assume he will slate with incumbent Sen. Susan Lee and Del. Ariana Kelly. In possibly the understatement of the year, Marc Korman, Hrant Jamgochian and Jordan Cooper have to be mighty unhappy tonight. In my recent preview of the D16 race, I gave Marc and Hrant a strong edge to win (though left Jordan in the hunt) and hinted that Susan and Ariana might slate with them. Bill’s reentry changes that. Only one delegate seat is now open, though all three are up for reelection. Choosing between Marc and Hrant for a slate is not an easy call. We’ll see if the incumbents make a choice or just leave it up to the voters. If I had to bet, I’d say they do the latter. In Montgomery County, incumbents don’t often slate with non-incumbents, though there are signs that this tradition is falling by the wayside. Neither Marc nor Hrant has such a clear edge that it makes it easy for the incumbents to opt for one over the other. The D16 race for the third slot just got much more competitive and interesting. 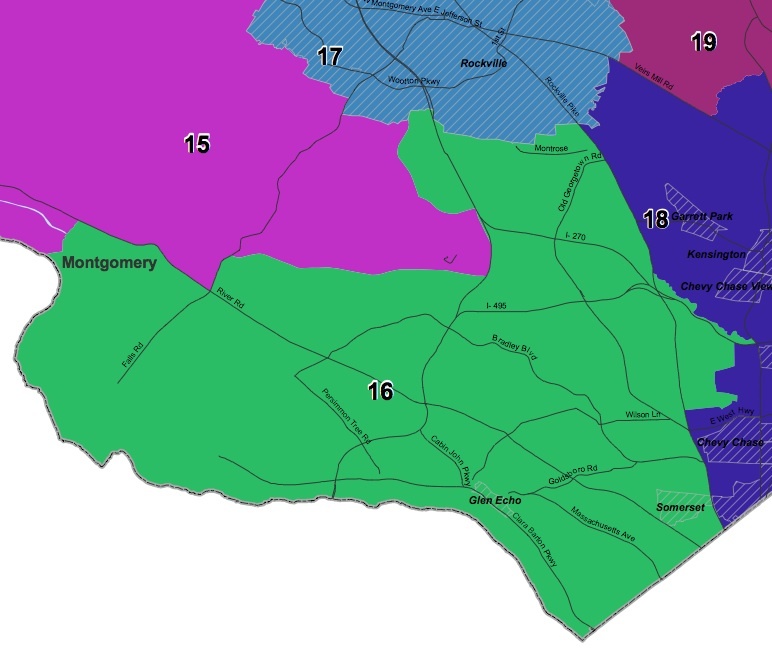 District 16 is centered on Bethesda. In redistricting, it lost a small amount of territory around Garrett Park and White Flint. It gained more area in Potomac to compensate. The overall net change is small. The district has a high number of Reform Jewish voters. Asian Americans compose 11% of the voting-age population. Their candidacies have produced rare open seats in D16. Well-liked Del. Susan Lee is gliding towards the Senate without opposition despite rumors of everyone from Duchy Trachtenberg to Kyle Lierman entering the race. None has filed and no one is expected to do so. Susan will almost certainly become the first Asian American senator in Montgomery County (in Maryland? )–and not from one of the districts with an especially high Asian populations. The action is in the delegate race. Del. Ariana Kelly probably never thought she would be the senior delegate when she joined the House in 2011 after having beat Kyle Lierman by 356 votes in the Democratic primary. Read: the election. D16 used to elect liberal Republicans like Sen. Howard Denis and Del. Connie Morella but that era just seems over. This is probably the wealthiest district in the State and the campaign account balances of the candidates reflect it. Ariana has $120K in her campaign account and is returning to the House of Delegates. She seems most likely to be joined by Marc Korman and Hrant Jamgochian. Hrant Jamgochian (yep, another attorney) ran in 2010 and made a very good impression. He won the Washington Post endorsement and came in a respectable fifth. Crucially, he carried himself well even after he lost–this does not always happen. Hrant has $116K in his campaign account. Jordan Cooper is working very, very hard but has only $27K in his campaign account. He is 27 (correction: he’s 28) but looks even younger–an advantage in almost every aspect of life except politics and getting senior citizen discounts. Jordan seems a dark horse in this race but his effort impresses and, at the least, has a political future. Gareth Murray won election from District 20 in 2002. He won the third slot in the Democratic primary when incumbent Del. Dana Dembrow imploded after being arrested for domestic violence. In 2006, he came in seventh in a field of seven, an unusually poor showing for an incumbent. He has moved to Potomac but retains ties to Silver Spring as the assistant pastor of a church. No money in his campaign account means a similarly poor finish on primary day but he is a welcome addition to the contest. Karen Kuker-Kihl is a frequent candidate. In 1998, she came tantalizing close to beating Republican Betty-Ann Krahnke in District 1 (Bethesda-Potomac) with 47%. In 2002, she performed abysmally in the District 16 Democratic primary. She hasn’t filed yet this year but is expected to run. Peter Dennis has not filed a campaign finance report (unless it is just not coming up on the website). He won only 419 votes in the 2010 Democratic primary and will turn in a repeat performance. In short, District 16 is less competitive than the number of candidates indicates. Only one question remains: will Susan Lee and Ariana Kelly slate with Hrant Jamgochian or Marc Korman? It’s unusual for incumbents to slate with non-incumbents but hardly in the news of the weird column. UPDATE: Major egg on my face for forgetting Kevin Walling. An openly gay candidate, Kevin moved to the district to run. While he has $30K in the bank and is a very personable guy who will be good on the campaign trail, I rate Kevin’s chances a below those of Jordan’s, who has a more impressive campaign operation.